IHS Markit recently published the “Manufacturing Technology Vertical Intelligence Service”, including a manufacturer survey for the transformative technologies adoption in the semiconductor, display and electronics manufacturing sectors. Transformative technologies, such as artificial intelligence, the cloud & XaaS, edging technology, connectivity, robots/drones and virtualization are shaping the semiconductor, display and electronics manufacturing sectors according to IHS Markit (Nasdaq: INFO), a world leader in critical information, analytics and solutions. 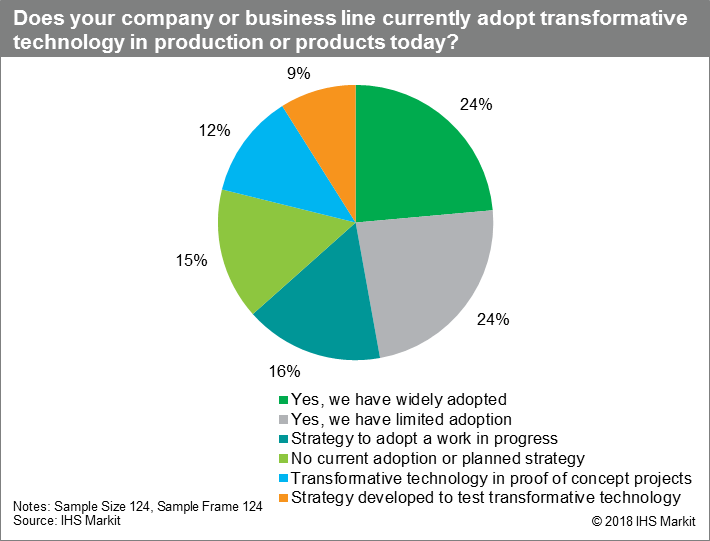 The survey shows that 24% of respondents think transformative technologies have already been utilized widely in their factories, and 24% of the respondents say that they already have limited adoption. Only 15% of the respondents’ companies are shown to be slower to adopt transformative technologies, with no current adoption or planned strategies in place. These results look very positive for transformative technology adoption in semiconductor, electronics and display manufacturing. IHS Markit thinks this positive result is probably more related to transformative technologies like cloud, connectivity, and physical automation, while AI in manufacturing is still very much in its infancy. The following question is about what type of transformative technology companies invested in most heavily in 2017. As seen, opinions of how much AI influences the manufacturing vary widely. Responses regarding the importance of artificial intelligence were split, with around 25% choosing “very important” and 25% choose “Not at all important”. IHS Markit thinks AI still needs more successful user cases to prove its value in manufacturing. 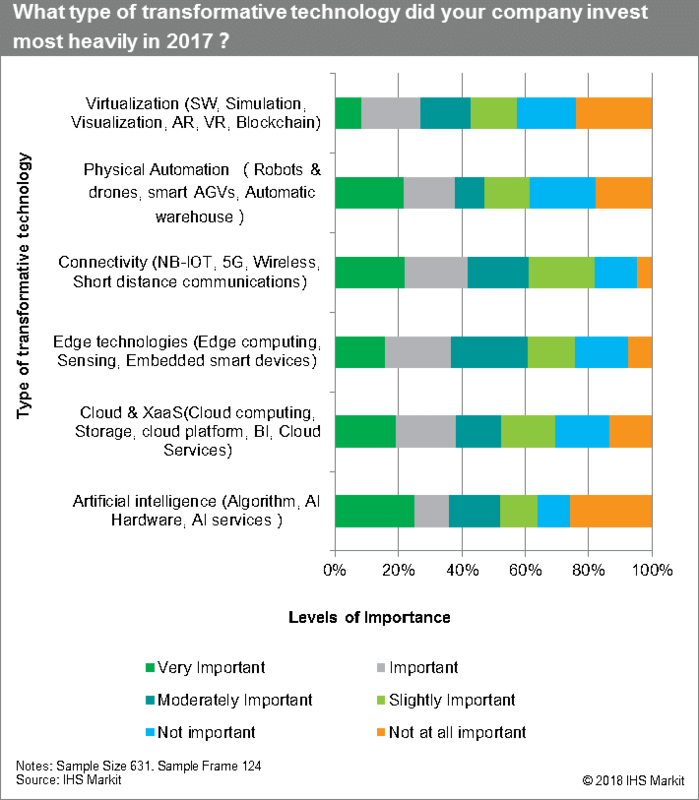 The Manufacturing Technology Vertical Intelligence Service published by IHS Markit is not only a manufacturer survey but is also a combination of manufacturer user surveys, analyst insights, and vertical-/industry-specific studies. The “Manufacturing Technology Vertical Intelligence Service” examines 6 categories of transformative technologies with the industry domain knowledge by sector as below. Take AI for example; AI is being implemented in three ways in manufacturing: cloud-based AI, in-device, and hybrid mode. Cloud-based AI has more computing power to analyze data, but there are potential issues around privacy, latency, and stability, which are very critical for manufacturing. Cloud-based AI will pave the way for technologically immature companies to utilize AI, radically transforming their usage and understanding of data. Some industrial platform companies cooperate extensively with AI companies, such as Siemens (MindSphere) with IBM (IBM Watson) and Fanuc with Preferred Networks, Inc.. Hybrid mode, combined with a stronger in-device AI and cloud-based AI, can help offset the aforementioned risks, albeit to only some degree. For instance, machine builders that deploy built-in AI machines are able to store data locally and thus safeguard their privacy. The in-device AI or hybrid mode technology also has the benefit of real-time operation, which is very critical for manufacturing. Even without a network connection, the machines can still run AI functions properly. This will require the machines to have more computing power for AI capability. In the manufacturing and logistics sectors, industrial robots and drones have been deployed mostly in automated warehouses to help employees work more efficiently. Some larger industrial robot companies are trying to make robots smarter. Fanuc is working with the artificial intelligence company Preferred Networks to develop an industrial robot that uses deep learning, i.e. learning a new task by itself. Google is also working on industrial robots, which can learn from each other through large-scale interaction with the cloud. Automated optical inspection (AOI)/machine vision with AI is also a promising use case in semiconductor, display and electronics manufacturing. Machine vision is an embedded technology that extracts information from digital images through image sensors. Specific applications include image acquisition, processing, analyzing, and understanding. There are many applications in the manufacturing sector, such as robot guidance, positioning for intelligent transportation systems, high-precision quality control and sorting, collision avoidance and obstacle detection from a drone. In the beginning, Automated optical inspection (AOI) machine used a set of simple rules to do the inspection, though it had a high false alarm rate. Now days, the machine learning and AI methods use self-adaptive, self-learning artificial intelligence algorithms to improve the success rate of recognition. The big data analytics also help detect the potential failure of critical testing units. For instance, IBM works with display panel makers on AOI machines to perform visual inspections. The AI system transforms raw data (edges, impurities, high-contrast areas, geometric features, abnormal texture, color and brightness features, etc.) into useful, high-level features such as position, similarity, distance, presence, quality, etc. Based on large amount of defects image， human knowledges and labelling work, the AI creates models which can be deployed easily to automate quality control inspections across key manufacturing processes in the semiconductor, display and electronic industries. In addition to artificial intelligence, edge computing, IOT, connectivity, cloud, AR/VR and other transformative technologies will shape the future of manufacturing, also bring new opportunities to industrial automation suppliers, machine builders and various players in the manufacturing ecosystem.